The Cosmic Fog Sonrise is a unique take on a frozen Hawaiian drink that will take you to a sun-soaked morning on the Big Island. Sweet and savory passion fruit blended with smooth, exotic kiwi and pineapples. All it takes is one hit to know this will be your new all day fruit vape. It will leave you searching for all the hidden flavors until the sun comes back up. 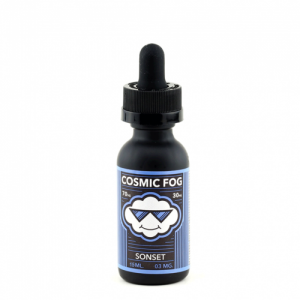 First of all, Cosmic Fog Sonrise tropical fruit-flavored vape juice is absolutely excellent. The second you open up the bottle and a marvelous scent of fresh fruits fills your nose. You can instantly smell sweet passion fruit, exotic kiwi and smooth pineapple – all of them are distinct and smell nearly the same as the real thing. Moreover, the VG/PG ratios of Cosmic Fog Sonrise are 70/30 so it produces a lot of great, thick vapor. The moment you inhale, your taste buds are already enjoying the terrific sweet taste of passion fruit. The nice, refreshing flavor of the exotic kiwi is what comes next and it is absolutely incredible. As you exhale, the sweet and smooth flavor of pineapple is what your taste buds pick up. Additionally, the aftertaste of this incredible tropical fruit combination leaves you wondering if what you had was not a refreshing Hawaiian drink. Overall, Cosmic Fog Sonrise is truly a quality product. It comes in 0mg, 3mg, 6mg, 12mg or 18mg nicotine levels. Furthermore, it produces an ample amount of thick vapor. Also, the vapor is really smooth and does not hurt your throat. 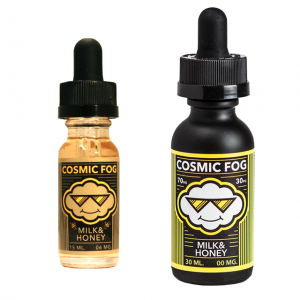 As a result, one try of this vape juice will keep any vape enthusiast coming back for more.